Adaptive devices that are specifically designed for skiing/riding use by individuals who have a disability (mono skis, bi skis, outriggers and sit skis) are allowed. If using adaptive equipment on the ski lifts, please call the contact listed below ahead of your visit so that we may prepare our staff to better facilitate your access to the mountain. Consistent with Monarch Mountain’s policy of “no motorized” use, the use of any power-driven devices or vehicles by the public, including other power-driven mobility devices is prohibited on the mountain. These safety requirements are based on actual risks and are not intended to be discriminatory in any way. Monarch Mountain supports the use of trained service animals during the winter operating season. Service Animals must be under control with a harness, leash or other tether; unless would interfere w/animal’s safe productive performance/or unless the person is unable, because of a disability (such as a seizure alert animal), to use a harness, leash or other tether. Service animals must be house broken; and be trained and utilized for a specific disability approved by ADA regulations. Monarch Mountain offers an optional orange bandana (at no cost) to use for easily identifying service animals to additional guests and staff. If Monarch Mountain properly excludes a service animal under § 35.136(b), it shall give the individual with a disability the opportunity to participate in the service, program, or activity without having the service animal on the premises. Consistent with Monarch Mountain’s policy of “no animals” on ski terrain or ski lifts during operating hours, which restricts the use animals to only dogs specifically trained, or in the process of being trained, for avalanche search and rescue work, to load and unload a chairlift, and under the direct control of on-duty Monarch Mountain staff. The use of service animals on ski lifts and ski terrain conflicts with Monarch Mountain’s safety requirements necessary for the reasonably safe operation of our on-slope activities. These safety concerns are based on actual risks and are not intended to be discriminatory in any way. Monarch Mountain is not responsible for the care or supervision of a service animal. 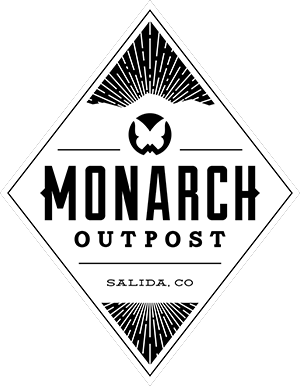 If there are any additional considerations that need to be made that are not described above, we ask for a 72-hour advance notice to help Monarch Mountain staff members make a reasonable accommodation. Specific questions or concerns regarding Monarch Mountain’s policies concerning ADA Accessibility, Adaptive Skiing/Riding, the use of Service Animals, and power-driven mobility devices, should be directed to the following individuals.